Summer has arrived! After the obstinate winter and temperamental spring we’ve had this year, I was convinced that New York was going to throw down the humid-est of humid New York summers on us, just to be the cruelest mistress it could possibly be. But instead, the universe has reminded me Cynthia, be a smidge more optimistic — and this summer has been nothing short of spectacular (so far). With the exception of a few rainy days earlier this month, June has been just an abundance of breezy, cool mornings, warm summer nights, and gentle sunshine. On the table, there’s been tart raspberries and ripe figs, icy-cold affogatos and our first homemade corn on the cob. Off the table, we’ve had lazy afternoon strolls, evenings with cool air wafting in through open windows. A balmy, sun-soaked picnic in Prospect Park, where I met the most incredibly lovely people, gave my shoulders a good toasting, and my heart to this little guy. The days are gloriously long, the kind where you get home after a long productive trek and find that it’s only 3 PM, the sunlight is streaming through the windows, and you still have practically an entire day laid out before you — one of my favorite feelings. The summeriest holiday of them all is, somehow, already coming up this Friday. (As an aside, is it just me, or do summer holidays become a thousand times more wonderful in the working world?) In celebration, I thought I’d share a blue-and-white recipe that is, if just shy of appropriate for Fourth of July, is at least appropriate for your own summer picnics. 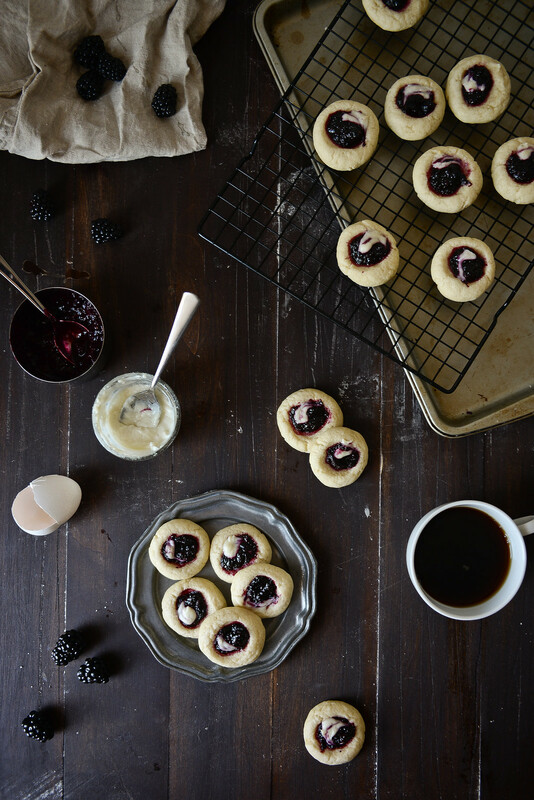 I’ve already sung the blackberry-goat cheese song earlier on this blog, but when I came across the idea of using goat cheese in cookies (and was totally, instantly, incurably smitten), it was a pairing I had to revisit. These cookies went through a little bit of an odyssey to get to where they are. 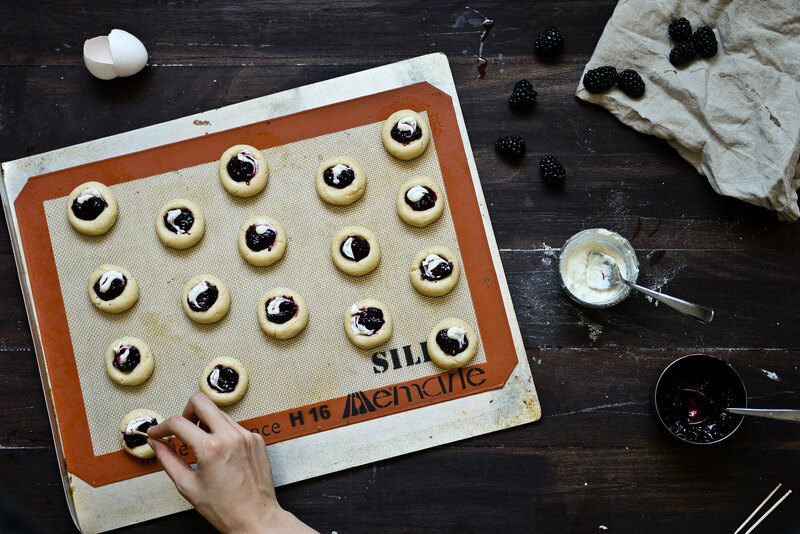 I originally thought I’d use blackberry syrup in Lindsay’s goat cheese sugar cookie to do some kind of blackberry swirl, which was maybe great in theory and messy, melty, and zero percent cute in practice. Then I came upon the idea of thumbprints, but with a sugar cookie base, they looked only like thumbprints before baking and more like diseased sugar-blackberry-discs after. 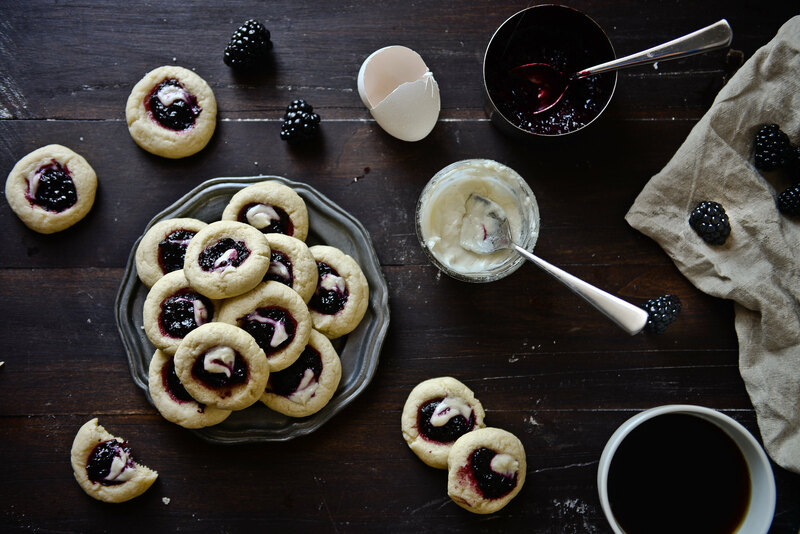 Finally, this batch gave me what I was looking for — a pillowy cookie with less sugar and just the right goat-cheesiness, that cradled just the right amount of blackberry jam and goat cheese in its dimple and held its shape stolidly through baking. Add a touch of raspberry or strawberry jam, and you’d have yourself a grand old Fourth of July cookie, I think. 🙂 Wishing you all a lovely long weekend. 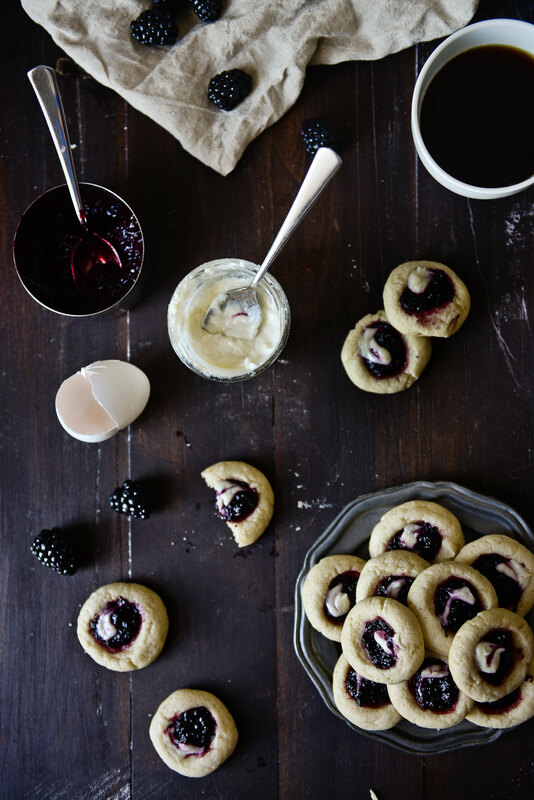 Blackberry & goat cheese thumbprint cookies. In a bowl, whisk together flour and salt. Set aside. Combine sugar, goat cheese, and butter in a large bowl and whisk until mixture is pale and creamy. Whisk in egg yolk and vanilla extract. Fold in the dry ingredients until incorporated and a dough forms. 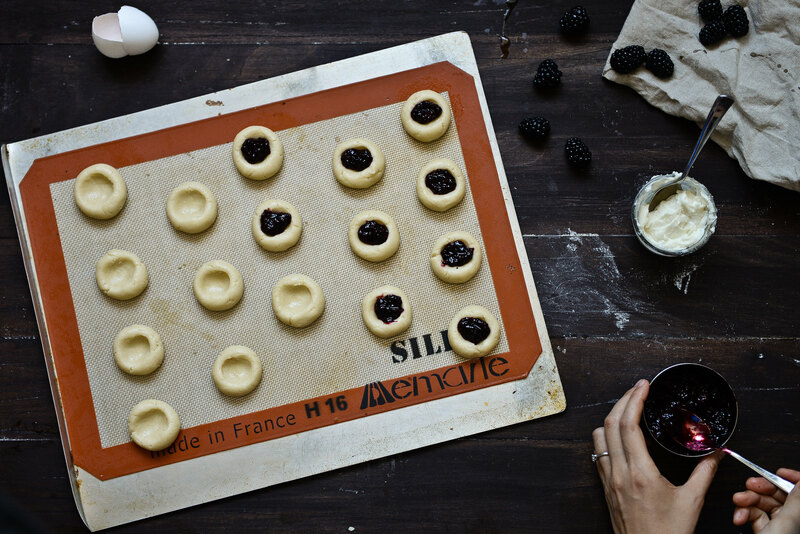 Chill the dough in the refrigerator while you prepare the blackberries. Scoop about a tablespoon of dough and roll into a ball. 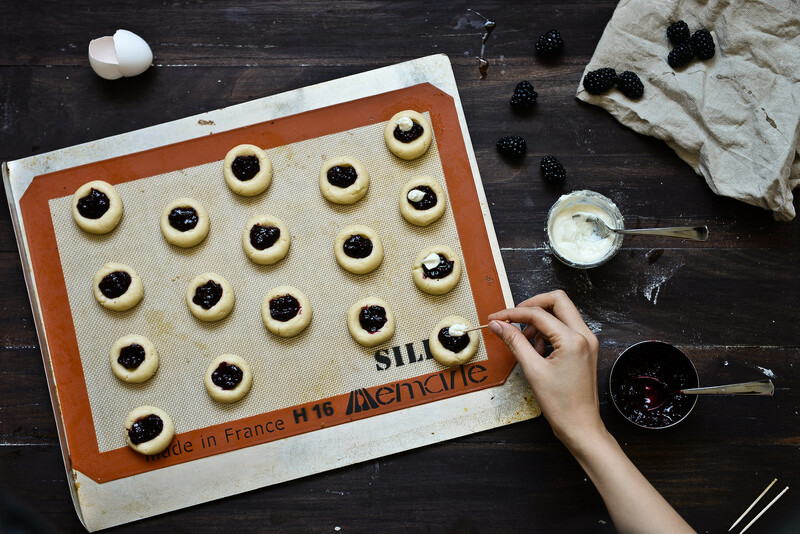 Place the ball on the cookie sheet and press an indentation in the dough to form a hollow for the jelly. Repeat with the rest of the dough, placing the balls about 1-2 inches apart (they will not spread too much). 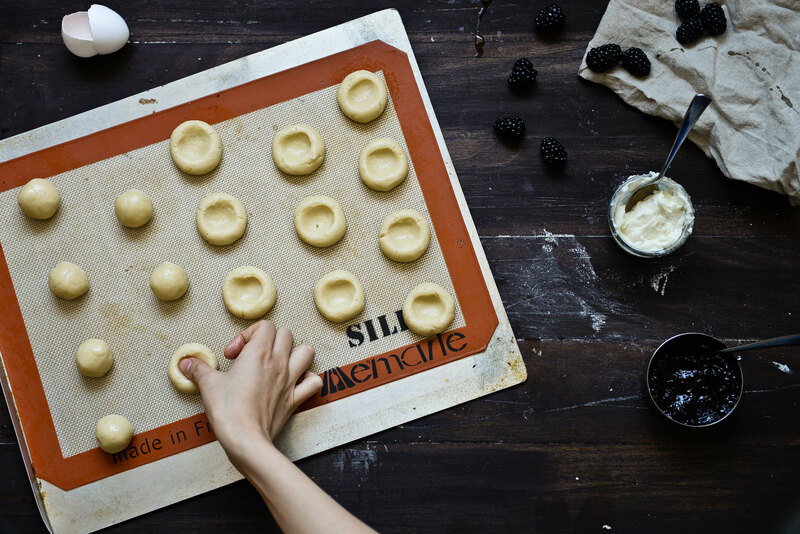 Place about a half-teaspoon of blackberry jam into each of the dough indentations, or enough to fill it. Combine goat cheese, a splash of milk, and powdered sugar in a pinch bowl. Microwave for 10 seconds to make the mixture slightly thinner and easier to swirl. Place a dot of goat cheese (or as much as desired) into each dough hollow. If you like, you can take a toothpick and run it through the cheese to swirl the jam and cheese together. Bake for 10 to 12 minutes, or until cookies are set at the edges. The cookies will be pale and soft, but the cookie should be able to lift away from the sheet and the bottom should be just golden. Let cool on the baking sheet for a few minutes, then transfer to a wire rack to cool completely. Bummer!!! Well, rest assured that we’ll be getting sticky-muggy over here before too long too. (In fact, this morning was pretty soupy.) Thanks so much, Anne! This is such an awesome flavour combo for a cookie!! So impressed – these sound great! It’s as hot an humid as an armpit here. But when things cool down? I’m all over these. BOO for armpit weather! The pits are closing slowly over New York too, I can just feel it. But at least it was nice while it lasted. I like the idea of goats cheese in here…as it’s not something I would eat in combination with blackberries…sounds like I’m missing out!! These look so dreamy!! I have been looking for a thumbprint without almonds since my husband is allergic so I will have to give these a try! They sound delicious! Happy 4th! Oooh, I hope these are what you were looking for! Boo for food allergies 🙁 Thank you so much, Leah! New York sounds amazing right now. I need to finally get there and visit that city! And these cookies!! Love the combo of blackberries and goat cheese! Haaa, I spoke too soon — just as I published this it got hot as all get out here. Oops… But still! Come visit in a few months!! 😉 Thank you so much, Tieghan! ugh, you’ve painted such a lovely picture of what summer is, i don’t think i could have said it any better. and how cute/beautiful are these cookies! i remember utilizing cheese in baked goods, and how it offered a creamy, tanginess to it all – yum! 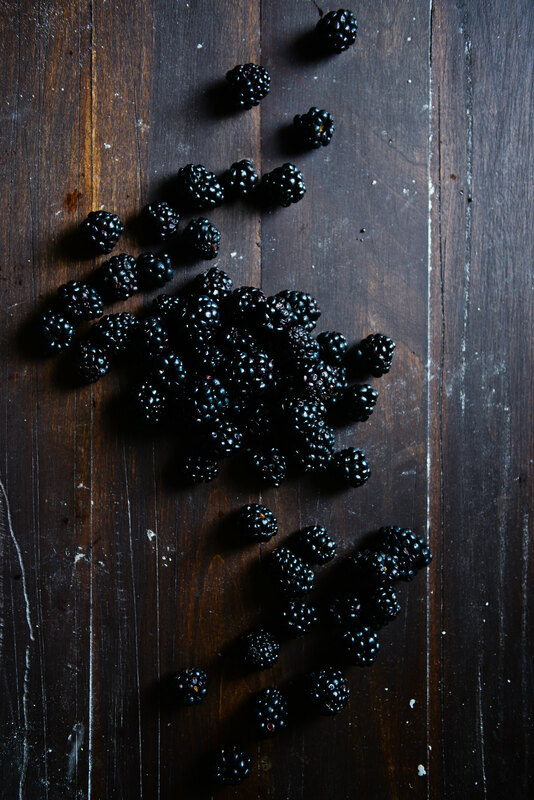 and what can i say about blackberries…just one of the prettiest berries there ever! Hahaha awww! I know, goat cheese in cookies was such a revelation for me! I tried these with some aged goat cheese (like Vermont Creamery’s bonne bouche) and that was even more nuts. Thanks so much for the sweet words, Erika! I finally got around to make these for a hot cocoa bar party last night on recommendation from my co-host and Cynthia, they were SO GOOD!!! I just wish blackberries were in season (I used raspberry jam instead) so I could make these exactly as you wrote them. But I looooved the goat cheese touch. Fantastic recipe, lady!!! Yums, blackberries are my eeeeverything. Hahaha!! I am so down with that. Hahaha oh nooo! I’m torn between feeling guilty and feeling like you should definitely try these cookies. Hahaha. Thanks so much, Pang! Wishing you a wonderful long weekend, dear Cynthia. First, the cookies look so sophisticated and delicious! And secondly, I am jealous of the weather where you’re at Cynthia! In London it’s like one day sunny, one day rain. My hair is frizzing up like NOTHING else! 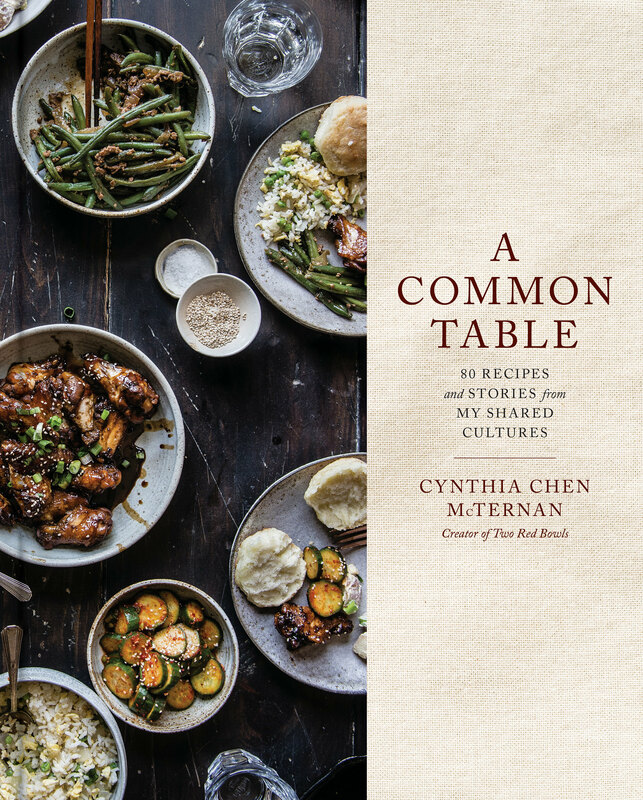 ohmygosh these look amazing cynthia!! i LOVE the idea of goat cheese in a thumbprint cookie. i’ve always had a soft spot for thumbprints 🙂 have a wonderful long weekend! Beautiful post, Cynthia. I totally agree with you on the whole summer-is-awesome thing. And SO NICE TO MEET YOU ON SUNDAY!!! Ohmygosh Robert and I keep talking about how ridiculously cute and sweet you are. Let’s hang out again soon, yes?!?!? What stunning cookies, the filling is gorgeous! These are so gorgeous! thumbprints have been the bane of my cookie experiments as of the last year, though i think i could make these with spelt or einkorn (which i tolerate better than regular wheat) and they might hold up! i hear you on thumbprint cookie difficulties. i’ve been all over the spectrum with thumbprint cookie fails. 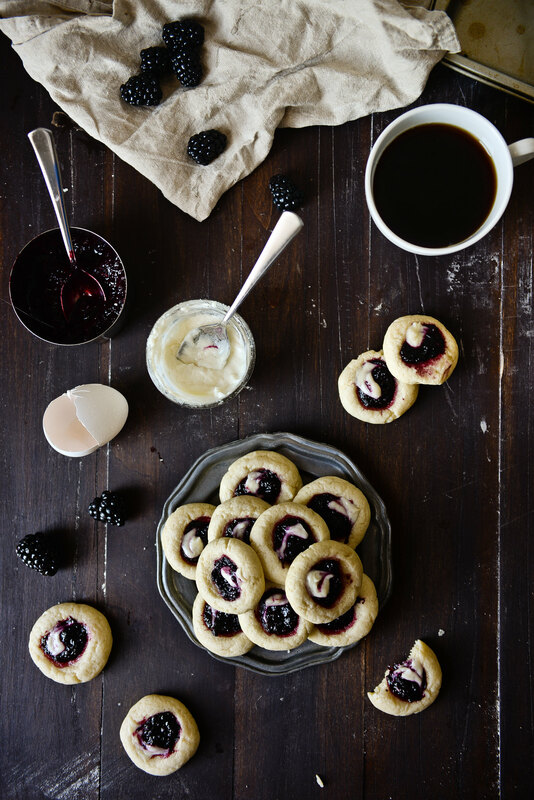 also, blackberry jam + goat cheese…. revelations all over the internet today, that being one of them. GIMME ALL THE BLACKBERRIES AND GOAT CHEEZZZZEE. in my mouth. Your descriptions of your glorious summer afternoons just make me want to frolic around the nearest meadow, wherever that may be. And with these cookies, too! And amen to the working world bringing out the best in holidays–a smidge sad (but I’ll take what I can get too, eh?). Hope you’re celebrating your weather even more! These look wonderful! What an original combination: goat cheese and blackberries…I don’t think I would ever have thought of pairing those two. Beautiful pictures! oh i love the idea of goat cheese in desserts! you have lovely hands… sometimes my hands in my photo startles me… but not yours…. Aww these are soooo sweet! Gorgeous photos! yes, these are absolutely the cutest thumbprint cookies i ever done seen. definitely will help me make my case to get a pet goat. Woohoo for the summer and blackberries and cute little cookies that I want to eat approx 1,000 of! oh the summer’s in our part of the world are nothing like yours. Brutal, really. These look beautiful! regardless! These are pretty cookies and surely tasty ones for July 4th. I’m with you about summer after the previous winter, I’m savoring every moment of sunshine. Hope you have a great weekend! I second Mandy’s hand comment! My hands look freakay in food photos. I try not to do it. These are beautiful! Blackberry season is about to start here in Washington. I’m so ready! Would you have to store the cookies in the fridge? I’d imagine you’d want to right? Hmm, good question! It’s probably best to refrigerate your leftovers, but they’ll be fine at room temperature for at least 8-10 hours. 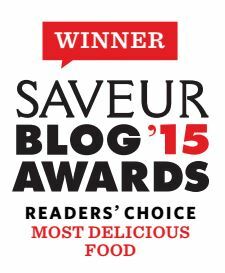 I don’t recall whether I stored mine in the fridge (we ate them all pretty quickly, ha!) but if I did, it wasn’t until that night, and I baked them up in the morning. YOU. I think you know what that means. (Also loving: stolidly. And your thumb printing in action.) xoxo. Yum, I absolutely love the flavor combinations here! These cookies look absolutely delicious (not to mention I’m a huge fan of goat cheese), I’ll definitely have to try them soon! Wow, love the sound of that flavour combination. I am going to have to try these! These are lovely. 🙂 The flavor combination sounds wonderful. Oh, thank you so much!! Not crazy at all! 🙂 I actually got it off eBay — it’s a Wilton Armetale Queen Anne-style pewter salad plate. You can find sets of them if you search “Wilton Armetale plate,” “Queen Anne plate,” “pewter plate” or any combination of that. Hope you find some you like! !